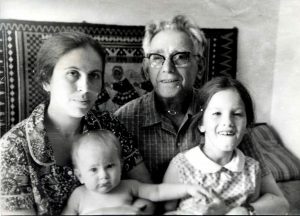 Bena Shklyanaya and Leib Averbukh with Polina Shklyanoy and Emily Shklyanoy. Kiev. Year 1975. In the beginning of the 1970s emigration became the leading topic of conversation. Leib’s nephew, Esther’s son, emigrated first and was able to locate Avrum’s children, Leib’s American nieces. As the time was approaching to apply for permission to emigrate, Leib’s pain became severe. Various medical luminaries could not come up with a diagnosis. Finally, he told me to proceed without him. Six weeks after we emigrated, Leib died of the cancer of the liver. My first time in Leningrad, in January 1962, took place during my high school winter break and coincided with the first day of Lejb’s retirement, Musya’s biologist sister-in-law’s recent return from her twenty-five-year exile to the Gulag, and the Khrushchev’s Thaw. The train arrived in the city at dawn, before streetcars began running. While waiting in the empty vestibule I was reciting Yevtushenko’s Babi Yar to myself again and again. As soon as Leib appeared I recited it for him, watching, I remember, with a patronizing smile his brows raised above his glasses. Am I by anti-Semites like a Jew. Until then Leib had never opened a book by a Soviet author and was not aware of the cluster of young writers and poets who had sprung up out of nowhere publishing words that a short time earlier would have had them executed had they whispered them. I had to remind myself that no danger lurked around each corner but the habit to expect it was as alive as ever, so simply holding these books and memorizing these poems was intoxicating. Their words felt too courageous, too honest to be allowed. A few minutes with Musya and Katya – and I felt at home. Musya’s sister-in-law came to meet me that evening, a petite sad soft-spoken woman whose daughter had refused to see her: exonerated or not, her mother remained an enemy of the people even if she took advantage of the permission to restore her Communist Party membership. She listened agreeably to Leib’s outrage over the senseless destruction of talented and dedicated people. “Well, if that’s what the Party decided, then it must have been for the best,” she said quietly in her cultured voice. “Best for whom?” he shouted. “Name one single person for whom the ruin of your family was good!” She smiled knowingly. He pointed at me, his finger almost touching my nose, “Look! Look and learn! Do you see what happens when people don’t think?” I expected the woman to feel offended but she continued smiling as if she was privy to something that he was not capable of comprehending. In addition to the exoneration, she received, in writing, the right to an apartment in Leningrad. Meanwhile she rotated between cousins. It took a year for Leib to secure a studio apartment for her. She died soon afterward. On each of my many visits, Katya waited for me it seemed more impatiently than Musya. She was always the first to greet me at the door, one side of her upper lip permanently crooked around the eternal cigarette. After hugging her I ran into Musya’s arms and stayed enveloped by her tall soft body until Leib grumbled impatiently. Musya, Katya and I led a sumptuous life, theater-wise. They knew every box office in the city; the word sold-out did not exist. We went to the best shows. At matinees, people like Musya, the remnants of the parasitic class, filled the seats: neat gray curls, pleated blouses with bows at the throat, dainty muffs, bowties, knife-sharp trouser creases – a scene from a period movie. Musya invariably introduced me as her niece and invariably received polite acknowledgments. Instinctively, I detected defiance in her perfectly modulated tone when she did not trust a person. On theater-less days Musya and I went shopping: stores were supplied so much better than Kiev’s. Musya clucked sympathetically over the shopping list my mother had compiled; most of the items were not deficit in Leningrad, like toothbrushes or buckwheat (I could not go home without a healthy quantity of buckwheat) or oranges or zippers or shoelaces – we didn’t even have to stand in lines, at least not long lines. But Musya did not limit our trips to the list; she spoiled me with imported clothes that were no comparison to what one saw in Kiev. Of course, for that we had to stand in long lines and fight crowds but we got a pair of ankle boots and sandals, a hat, a skirt, a jacket, wool tights. I still remember them all; they served me for many years and made me proud every time somebody asked enviously where I got them. The more I bought the wider Musya beamed and the more I had to borrow from her. As if she or Leib would let me pay back. Leib owned me in the evenings. He was no theater-goer; it took my teary eyes to convince him to take me to a Yevtushenko’s concert at some obscure venue. He liked what he heard and got swept up in the excitement of the wide-eyed audience where he was the oldest by far. He had avoided books by Soviet authors because he did not accept socialist realism as a literary genre. But now he asked me to recommend what to read and checked out my choices from the library to keep pace with me. Mainly, we spent the evenings talking. I gushed about the freedom and promise of the post-Stalin epoch – the future belongs to me, as I put it. Leib threw in observations that chilled my enthusiasm and struck doubts I did not want to have. “Khrushchev did not give us freedom. People are born free, freedom cannot be given; but sometimes you have to lock it away inside you. You know what cannot be locked away? Being a mensch. And only you know if you are a mensch.” “Stalin was a criminal but Lenin a saint? My dear, Lenin was a political prostitute, a person without a conscience. He started concentration camps, he was a murderer.” I gasped at such sacrilege and sputtered my objections. Leib’s bookshelves hid Musya’s pre-revolution newspapers and magazines with news reports and stories that even during the Thaw would get one arrested. He placed a stack in front of me. He placed the old and the Soviet editions of the encyclopedia in front of me: the same war, for example, listed Russia defeated in the former and victorious in the latter. With Leib, it was not a matter of proving his case in a quarrel, it was a matter of resetting my brain, wiring it to recognize logic. Everything was simple, all I needed to do was to think. Leib’s dream project for retirement was adding English to his cache of languages. He acquired a thick grammar textbook, an unwieldy Russian-English dictionary, a two-volume English-Russian dictionary, and began with Shakespeare. A cousin, an English teacher, helped with the pronunciation. Four years later when he read and understood the Bard easily, he placed the textbook and the dictionaries into a capacious avoska and handed it to me as I was packing for my return trip home. I could not throw out books, either. Instead I began learning English, not with Shakespeare but modestly, with the basics. I still have the textbook.